If you want brick oven results without a brick oven, this propane-fired pizza oven has you covered, with a double-layered ceiling that keeps heat inside and cooks the top of the pizza properly at the same time the crust browns. 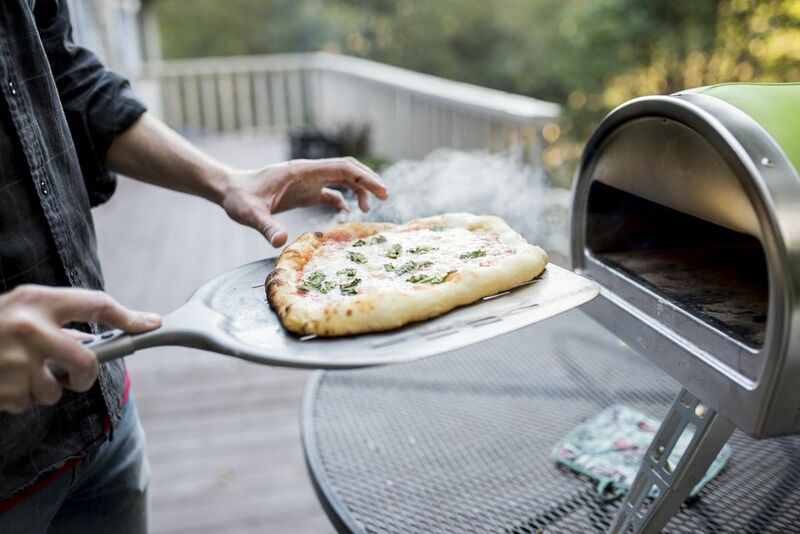 This preheats quickly, so you’ll be ready to cook in about 15 minutes, and it gets hot enough to cook a pizza in eight minutes or less with the 17,000 BTU burner. In fact, you might want to turn the heat down just a little from the maximum to avoid incinerating the pizza while you pop open a beverage. This has a built-in ignition valve and temperature adjustment, so you can turn the heat up or down to find the ideal temperature. A built-in temperature gauge lets you check the internal air temperature, and the ventilated door lets you keep the hot air in or ventilate it if it gets too hot. The exterior is stainless steel for easy cleaning, and it will never rust. This includes a 20" x 13" cordierite ceramic pizza stone, a regulator for the propane, and a five-foot hose so you can attach a bulk propane tank. You can cook pizzas up to 13" in diameter. If you want something larger, you can fit an oval or rectangular pizza that’s as wide as the 20" stone. If size is an issue, this pizza oven has a low profile that stores more compactly than other pizza ovens, and the cord wraps around to stay out of the way. The design is perfect for pizzas up to 12" in diameter, and the nonstick baking plate creates a crisp crust and makes cleanup easy, even if your cheese overflows. The floating hinge means you can cook thick or thin pizzas with ease. This has a power-on indicator and a ready-to-bake indicator, but there are no temperature controls — just turn it on and it starts heating up. Since this has a nonstick surface rather than a cooking stone, besides cooking the usual pizza, flatbreads and other baked goods, you can also use it for cooking eggs, nachos, frittatas, cookies and more. The large ruffled edge on this pie plate is different from standard pie plates, creating a beautiful presentation whether the plate is filled with pumpkin pie, cornbread, pull-apart, biscuits or dinner rolls. The large ruffle also makes the pie plate easy to remove from the oven and makes it simple to form a decorative pie crust border. If you prefer cooking your pizza indoors, but you don’t want to heat up your huge oven and your kitchen, this pizza oven does the job — and it’s fun to watch. It cooks pizza in about half the time oven-baking would take, whether you’re making a frozen pizza or your own homemade version. 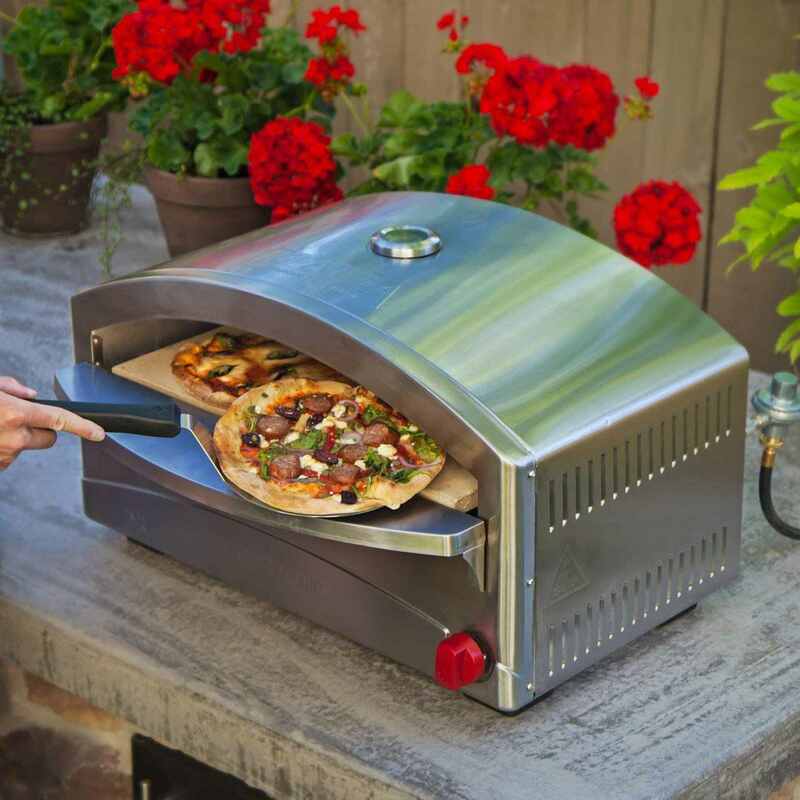 The pizza tray rotates continuously to bake the pizza evenly without burning. It heats from both top and bottom, and the heating elements can be controlled separately, so if the crust is browned before the cheese is gooey, you can turn up the top heat and turn down the bottom heat. A timer turns off the heat automatically, so you can walk away without worrying about a burned pizza, and an audible signal will alert you that your pizza is done. The pizza tray is removable and has a nonstick coating for easy cleaning. This can cook pizzas up to 12" in diameter. Oh sure, you love pizza, but you don’t make it often enough to justify counter space for a dedicated pizza cooker. Well then, this countertop convection oven might be just the thing you need since it is both a pizza oven and a convection oven. The dedicated pizza drawer is calibrated to cook pizza perfectly, and it can accommodate pizzas up to 12" in diameter. When you’re not making pizza, it has functions for warming, toasting baking, and broiling in the upper turbo convection oven. A baking pan and broiling rack are included. The upper and lower ovens have separate controls, but they can’t be used at the same time. This has a 60-minute timer with auto shut-off and an audible alert. If you like the idea of a wood-fired outdoor pizza oven instead of a propane oven, this is the one for you. It’s also more portable than propane ovens, since you don’t need to carry a propane tank. The chimney clip makes it easier to pack or move the oven, whether it’s across your yard or to a campground. This oven can reach a whopping 932 degrees, and heats up in just 10 minutes. When it’s time to cook the pizza, don’t walk away, since it can fully cook a pizza in just a minute. The body of the cooker is insulated to maintain the heat and this updated model of the oven has a new wood pellet burner that provides better temperature control for more consistent cooking, no matter how many pizzas you’re making. And since they cook so quickly, you can make enough for a party in no time. This is made from stainless steel, so it’s easy to keep clean and won’t rust. It has three legs, so it’s stable on uneven surfaces, and it includes a 13.2" x 13.2" cordierite baking stone and a pizza peel, so you can cook pizzas up to 13". A gas burner is being designed for use with this unit. Are you serious about pizza? This outdoor oven is built for enthusiasts, with a 60,000 BTU burner, push-button ignition, convection cooking, and a rotating tray for even and consistent browning. This can cook a pizza up to 16 inches in diameter in two to three minutes. The motor that rotates the pizza stone can be operated with two D batteries, or you can plug it in to a standard electric outlet if you have one available. The oven has swivel casters and steel handles so you can move it easily outdoors or move it indoors for safe storage. The ignition requires one AA battery to operate. Some users have noted that the tray rotation works better with the addition of a thrust bearing, which costs less than $12, but it’s not required for the unit to operate. You might have tried cooking pizzas on your gas grill, but the problem is that when you lift the lid, you lose the heat. The air temperature drops, but the grill — with or without a stone — stays hot. So your pizza crust cooks much faster than the top of the pizza. This has a stone baking chamber that retains heat, and an enameled steel housing for easy cleaning. The design creates convection air flow in the chamber that cooks the pizza quickly and evenly. It can cook a pizza up to 13" in diameter in just two to three minutes, depending on your grill. Because this box has to heat thoroughly to cook the pizza evenly, it can take up to 30 minutes to preheat, depending on your grill, the wind, and the outdoor temperature.